Nokia’s venture into Android market is one change all the smartphone users are curious to get their hands on, from all the corners of the globe. The Nokia C1 is the flagship Android device that will mark the entry of Android smartphone computing. The Nokia C1’s configuration includes an Android Marshmallow operating system, a Qualcomm MSM8976 Snapdragon 652 chipset which brings an Octa-core (4x1.8 GHz Cortex-A72 & 4x1.4 GHz Cortex-A53) to the table. The graphics on this unit are to be powered an Adreno 510 chipset. The phone comes with 2GB RAM as standard. The Nokia C1’s primary camera is to be a 13MP unit which features Geo-tagging, touch focus, face detection, HDR, panorama, autofocus, and LED flash. The camera records [email protected] 30fps videos. The front shooter on this is a 5MP camera. 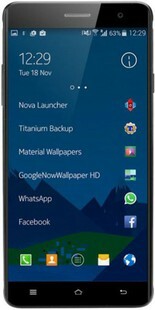 The Nokia C1 full specification has not been released yet. It is to come with an internal storage of 32GB and it is not confirmed yet, if there is an option to use expandable memory. The Nokia C1 comes with a 5.5 inch IPS LCD touchscreen which boasts of a screen to body ratio of 79.9%. The screen produces a display resolution of 1080x1920 pixels with a pixel density of 401 pixels per inch. As the complete Nokia C1 features and price are not announced yet, it is difficult to give out a conclusive review about this yet. Keep tuning to BestPriceOn for more insights. Nokia C1 full specs and reviews as of Apr 2019. Buy it here!